More than any other continent, Africa is unfairly homogenised; talked about as if it has an unvarying history, is in possession of a uniform culture, and faces generalised problems. At times, it is even mistaken for a single country. Unsurprisingly for a landmass that is bigger than the US, China, India and much of Europe put together, Africa is incredibly diverse. Unfortunately, one of the ways that this difference manifests itself is in terms of infrastructural development. According to the World Bank, it takes 12 days to export a container from Egypt, at a cost of $625, but transporting the same container from the Central African Republic takes four times as long and costs almost nine times as much. The infrastructure gap between Africa and Europe or the US may be significant, but national discrepancies remain a pressing issue too. Hampered growth is one of the most disabling side effects of poor infrastructure. It’s easy to take roads, clean drinking water and electricity for granted, but without reliable access to these essentials, doing business becomes virtually impossible. This, in turn, makes it difficult to attract the investment required to fund new infrastructure projects. In an effort to escape this vicious cycle, the African Development Bank (AfDB) will use this year’s Africa Investment Forum, due to begin on November 7 in Johannesburg, to bridge an infrastructure funding gap of $130-170bn a year. If the AfDB is successful, not only will it offer hope to its impoverished nations, but it will generate benefits for the developed world too. If it is not, Africa will remain a continent where some nations are on the road to prosperity, while others are in danger of being left behind. Currently, Africa’s infrastructure is a mixed bag. While Angola has a road density of just 4km per square kilometre of land, South Africa’s figure is more than 15 times higher. Africa’s larger economies may be able to fund their own developments but for many others, this simply isn’t practical. Foreign investment, therefore, is set to play a major role in financing future infrastructure projects. Professor Landry Signé, Distinguished Fellow at Stanford University’s Centre for African Studies and author of Innovating Development Strategies in Africa, believes that barriers to foreign investment must be eliminated, even though many of the struggles facing African countries today stem from their colonial past. Certainly, the growth rates being witnessed in many African countries will fill foreign investors with confidence that their funding will be generously repaid. 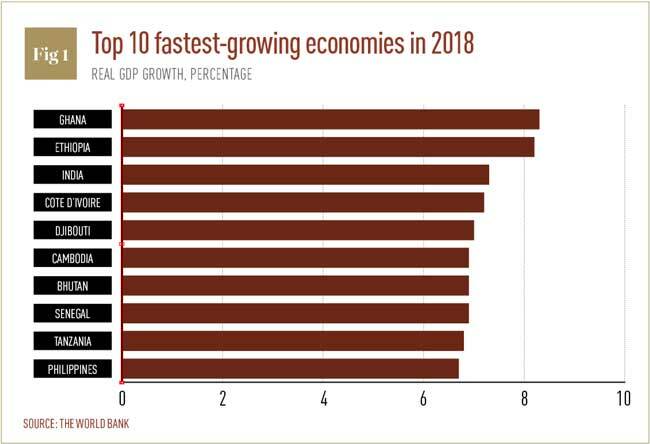 Seven countries in sub-Saharan Africa (Côte d’Ivoire, Ethiopia, Kenya, Mali, Rwanda, Senegal and Tanzania) posted growth rates above 5.4 percent between 2015 and 2017, and – according to the World Bank – Africa is home to six of the world’s 10 fastest-growing economies this year (see Fig 1). That being said, high levels of risk can often accompany rapid growth, although that hasn’t seemed to deter everyone. China-Africa relations are at an all-time high, with Beijing proving more than willing to extend its One Belt, One Road initiative across the continent. Last summer saw the completion of the Nairobi-Mombasa railway line in Kenya, with China agreeing to finance 80 percent of the $11.17bn cost. The new line will reduce travel times between the country’s two most important cities to 4.5 hours and help Kenya push its proportion of freight trade up towards its 40 percent target. This is far from the only example. Across the continent, Chinese-backed railway, port and motorway projects can be found at various stages of completion. In Egypt alone, China has pledged $35bn to fund the creation of an entirely new capital city east of Cairo. Other nations are certainly helping with Africa’s infrastructure burden, including India and the US, but China is often considered the most noteworthy – and not always for the best reasons. There is a growing concern, partly justified and partly inspired by western fears of a global power shift, that China’s infrastructural investments are not entirely altruistic. The cost of the Chinese-funded Addis Ababa-Djibouti Railway in Ethiopia totalled $4bn, almost a quarter of the Ethiopian Government’s expenditure over an entire year. It is possible that the economic benefits of the railway and other projects will help foster economic growth in the country and enable Ethiopia to repay this sum but, if not, China may seek repayment through political agreements or favoured access to natural resources. Suspicions were certainly not eased in January, when reports indicated that China had been systematically hacking the African Union’s (AU) computer systems for five years. 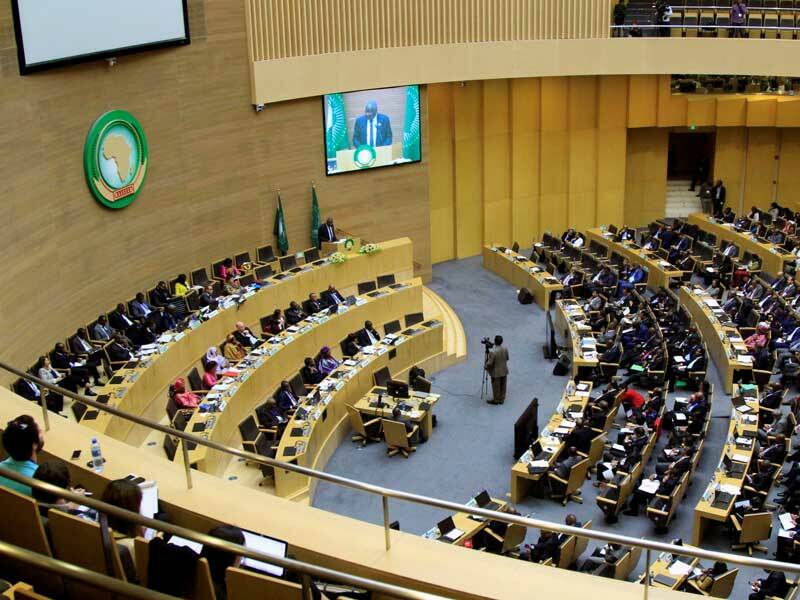 The AU’s $200m headquarters in Addis Ababa was financed by Beijing and built by China State Construction and Engineering, which allegedly allowed Beijing to conduct nightly data transfers and install hidden microphones in desks and walls. China has denied the accusation. Of course, African countries are not naïve when it comes to international assistance. Having been subjected to colonial rule for a number of years, they are well aware that foreign investment is sometimes repaid with more than just interest. That being said, there is no reason why Chinese-backed projects can’t provide infrastructural and development gains in Africa in the here-and-now, while also providing long-term benefits for Beijing. Despite its size and abundance of natural resources, Africa is not a global player in terms of world trade. There is no doubt that challenges in the transportation and logistics industry have hampered the trading capabilities of many countries, not only intercontinentally but with their neighbours too. In 2011, for example, intra-African trade represented just 11 percent of African trade globally. Although South Africa sneaks into the global top 20 of the World Bank’s Logistics Performance Index, African countries also occupy five of the bottom seven places. 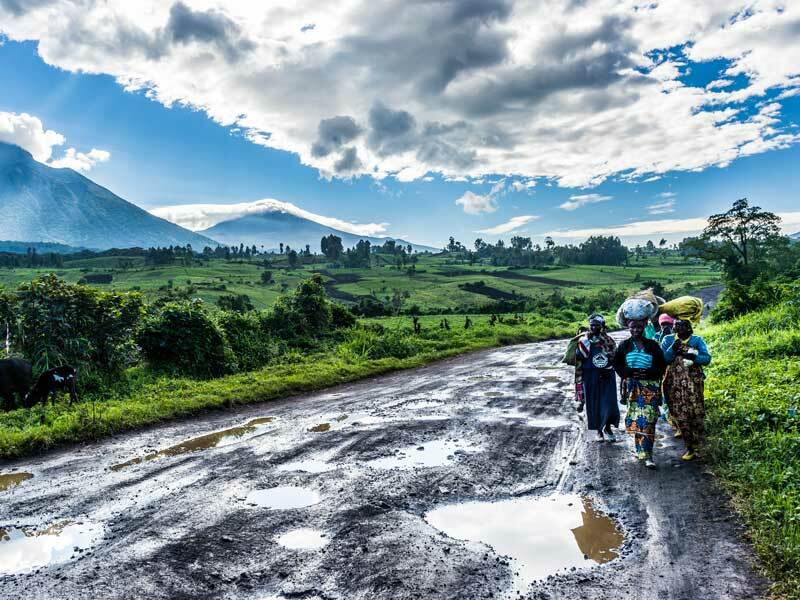 Part of the blame for Africa’s infrastructural shortfall is geographic: the landscape varies hugely across the continent, with nations like Algeria and the Democratic Republic of Congo having to cope with vast deserts and extensive forests respectively. Human failings cannot be overlooked, however. Past efforts to improve infrastructure on the continent have often come up short. Corruption, security concerns and the threat of political instability are, to varying degrees, issues that threaten to derail projects that get past the approval stage. 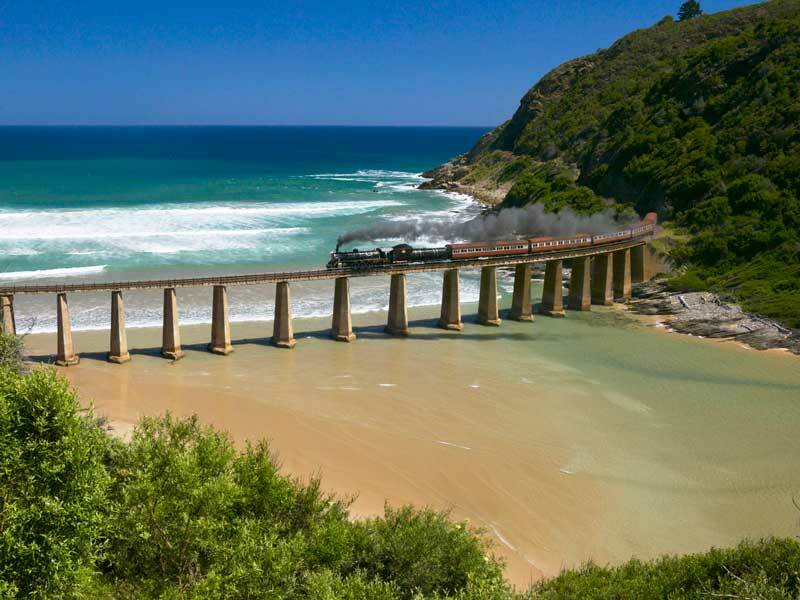 While the Programme for Infrastructure Development in Africa has shown promise, only four of its 51 major projects have reached the advanced implementation stage so far. Whether the scheme can meet its ambitious funding goals remains to be seen. If infrastructure can be improved, it would provide many African nations with a means of pulling themselves out of poverty. By improving logistic and trading networks, countries would be able to make better use of their natural resources. Mozambique, for example, is rich in aluminium, coal and natural gas, but poor in terms of its trade facilitation and logistics. Its current levels of coal production exceed its rail capacity, while the road network, which is largely unpaved or underdeveloped, causes further bottlenecks. Ensuring Mozambique can make the most of its resources will go a long way to improving citizens’ quality of life. Encouraging private transport and logistics (T&L) projects will also help stimulate domestic demand. T&L investors will have a keen eye on the retail, agricultural and manufacturing sectors, which are all performing strongly but have plenty of room to grow. In Tanzania, 20 percent of land is suitable for farming, but only five percent is currently cultivated. Energy exports to the US and China are growing rapidly, but further investment is needed to utilise untapped reserves. By investing in infrastructure, African countries are not just improving their business and trading capabilities, they are igniting a catalyst for future growth as well. When news of the supposed AU hacking emerged, the biggest disappointment for AU Chairman Paul Kagame did not relate to Chinese surveillance. “I would only have wished that in Africa we had got our act together earlier on,” he said. “We should have been able to build our own building.” His remarks convey a sense of frustration that some African nations have not yet achieved the expected level of development, but the future still offers hope. Bringing these projects to completion would not only help improve the economic situation in the countries concerned – it would also provide a boon to investor confidence, giving them further reassurances that they will receive a return on any funding. This would encourage additional developments across land, air and sea that are much needed in a continent where the population is expected to double by 2050. Africa’s wealthier countries also need to act now. Making greater use of municipal bonds would represent a good starting point, but this will require national governments to give major urban areas a greater degree of financial autonomy. Interference at the national level hampered Dakar’s efforts to sell municipal bonds to investors back in 2015, resulting in the loss of $40m of capital. Across the last two months of 2017, US cities raised more than $111bn of municipal bonds for infrastructure projects and other needs, but urban areas in sub-Saharan Africa have raised less than one percent of this amount since 2004. It is difficult to catch up with the West when countries are not taking advantage of all the investment opportunities available to them. Certainly, Africa has unique challenges to overcome if it is to develop its infrastructure further, but it also possesses countless opportunities. For national governments, identifying funding prospects, both domestic and international, must be made a priority. Strengthening financial regulations and political reputations will also encourage investors to back prospective developments. Each country, city and individual project must, of course, be assessed on its own merits, but if Africa’s infrastructural gap can be closed, then it could deliver great things for the entire continent.